To ensure we’re a great fit for you, apply for a complimentary styling session so you can learn exactly how we plan to create the wardrobe of your dreams. Watson Style Group is an online wardrobe building service for women who want a closet full of good-to-go outfits for an on-the-go life. 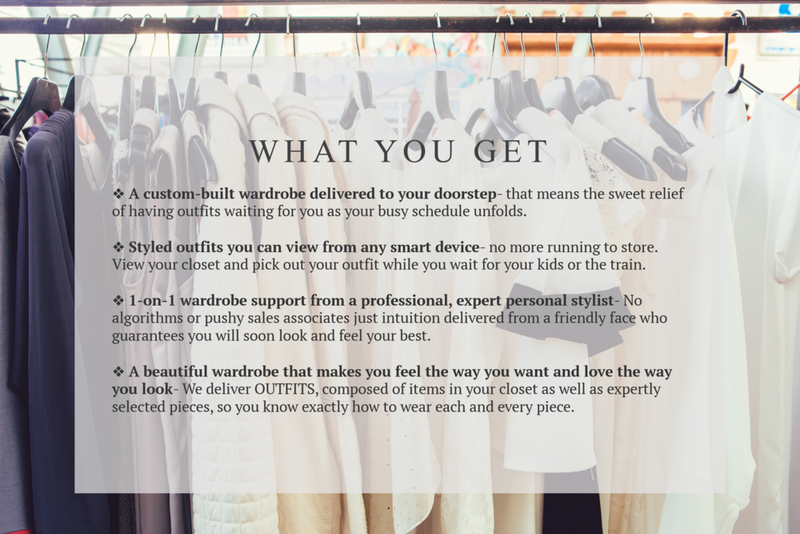 ❖ We begin the self-discovery process, curate your current closet, and reveal the vision for your new wardrobe on your very first appointment. ❖ We take care of all your shopping- ordering, calling, overnighting, deciding and returning- to build you a robust wardrobe you'll use for years. By this time next month, you'll be dressing brilliantly. ❖ Ding-dong! Deliveries! Your wardrobe magically arrives on your doorstep, pressed and ready to go. ❖ Once we know your keepers, you'll have your own webpage of outfits that can be viewed on any smart phone, tablet, or computer so you never have to think about what to wear again. You'll get dressed in minutes, be on time and have more energy for the things you love. We shop anywhere and everywhere to create your specific style. Your wardrobe gets delivered, and returns picked up, right from your doorstep. You'll save money. Eliminate buying stuff that crams your closet and still leaves you feeling like you have nothing to wear. Never stress about what to wear again with a digital lookbook of your outfits viewable on any smart device. This isn't one size fits all. You'll have your own personal stylist and she kindly & lovingly creates your dream wardrobe. ©2018 Watson Style Group. All rights reserved.